Are you looking for a flavorful dinner recipe you can have on the table in under 30 minutes? Who isn't, right? My Easy Thai Chicken thigh recipe is the answer to your dinner dilemma. Chicken thighs are my go-to protein. I always keep them in the freezer, and on those nights I don't know what to cook, I pull out a bag of chicken thighs. I buy them at a warehouse club, like Sam's Club, and portion them into freezer baggies when I get home. I can usually get 4 thighs to a quart sized bag. I stack them neatly in my freezer so I can quickly grab them when I need them. Being a food blogger, you'd think I'd always have a plan for dinner, but that is just not the case. I'm no different from anyone else. Sometimes dinner time sneaks up on me and I have no clue what we're going to eat. 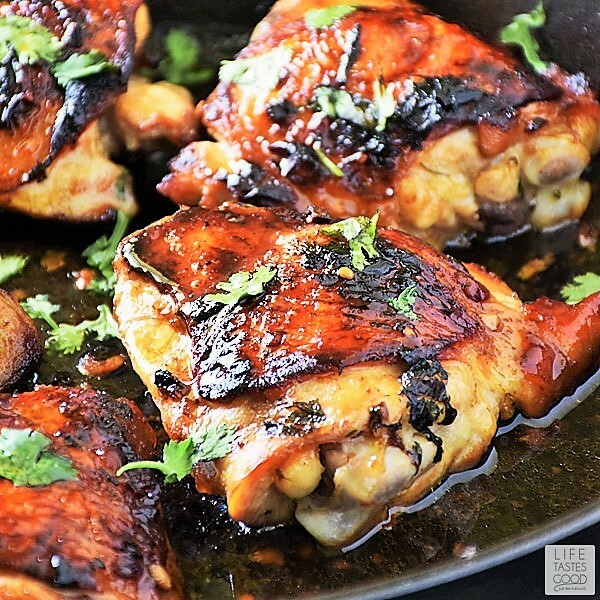 When that happens, most of the time I reach for a bag of chicken thighs and make my Pan Roasted Chicken Thighs or this Easy Thai Chicken thigh recipe. Both are simple to make with ingredients I typically have available and they pair nicely with a garden salad for a delicious, healthy meal. When I'm on top of my game and have a plan for dinner, chicken thighs are typically in the weekly rotation. I have a lot of chicken thigh recipes. 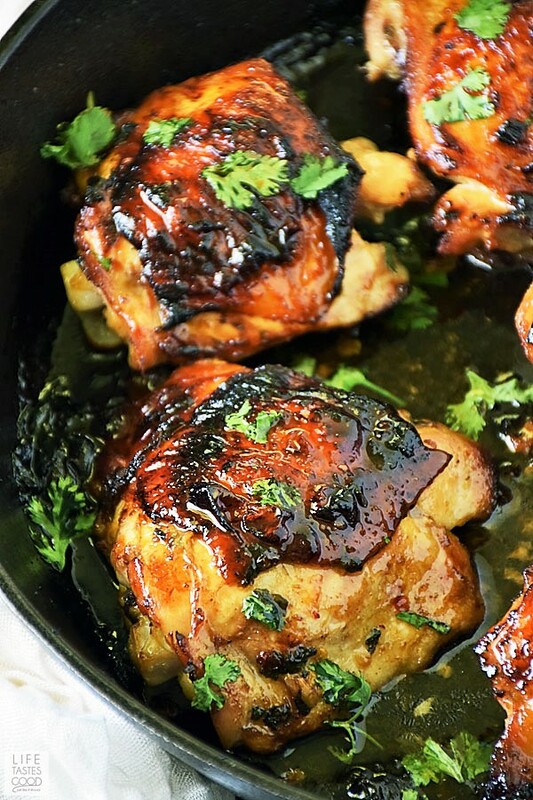 Some that are a little more involved like my Easy Balsamic Chicken or my Baked BBQ Chicken Thighs that are made using leftover BBQ sauce from my Beer Braised Beef Brisket. The recipe for the chicken thighs is easy, but you just have to plan ahead a little and make the brisket recipe first. All in all, it makes meal planning easy. Because chicken thighs are great!! They are so flavorful and versatile, easy to cook, and best of all they are inexpensive! I prefer the bone-in and skin-on chicken thighs as they have more flavor and cost less. I do, on occasion, use the boneless, skinless thighs like in my Easy Grilled Chicken Thighs and my Honey Glazed Spicy Chicken Thighs. 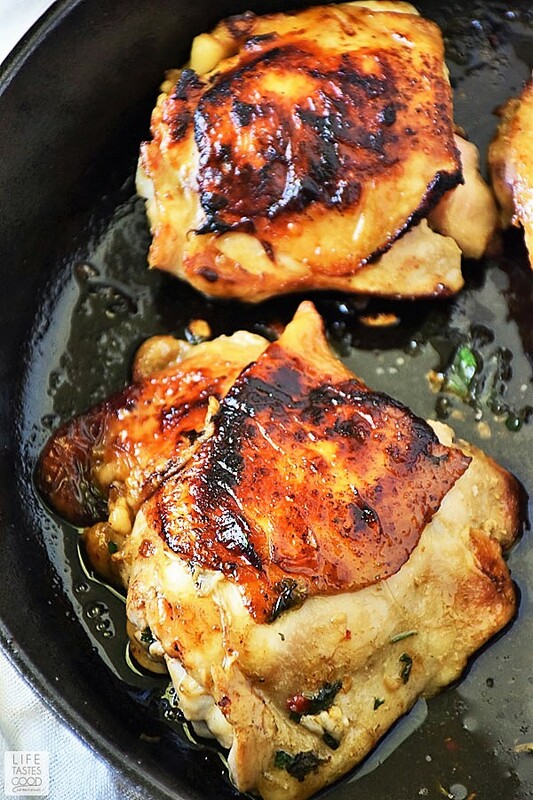 If you prefer the boneless, skinless chicken thighs you can use them for most of my chicken thigh recipes if you adjust the cook time accordingly (won't require as much cook time), but the bone-in and skin-on thighs will have more flavor and you'll pay less for all that flavor too - you can't beat that!! I LOVE Thai food. Do you? What's not to love? The flavors, the textures, the aromas! I can't get enough of it. Fresh Thai basil, cilantro, and ginger are common herbs used in Thai cooking and chili peppers are used to add heat. I used red pepper flakes in this recipe to add a little spicy sweet heat. I love how easy it is to adjust the amount of heat with the red pepper flakes. A little goes a long way! What are your favorite flavors from Thai cuisine? Are you looking for a flavorful dinner recipe you can have on the table in under 30 minutes? Who isn't right? My Easy Thai Chicken thigh recipe is the answer to your dinner dilemma. Combine 1/3 cup basil, 1/3 cup cilantro, 1 tablespoon ginger, 1 tablespoon garlic, 1/4 teaspoon red pepper flakes, 1 1/2 tablespoons soy sauce, 1 1/2 tablespoons Worcestershire sauce, 1/2 tablespoons olive oil, and 1 1/2 tablespoons brown sugar in a bowl and mix thoroughly. Place chicken in a large container or a zip top bag and spread marinade over chicken, being sure to coat each piece. Marinate for several hours or overnight for maximum flavor. When ready to cook the chicken thighs, preheat the oven to 450 degrees F. Remove the chicken from the marinade and discard marinade. 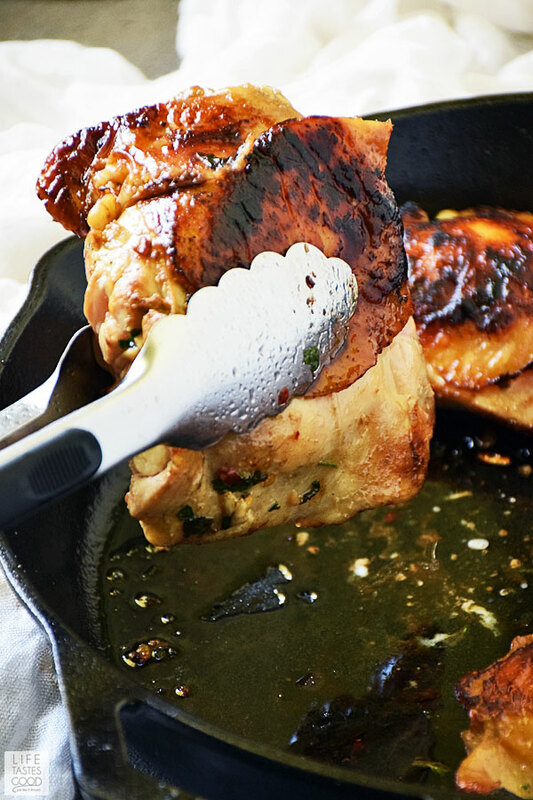 In a 12" cast iron skillet over mid-high heat, sear the thighs 3-5 minutes skin side down. The chicken will release easily when ready to turn, so if it seems to be sticking when you try to turn it, let it sear a minute or two more. Once the chicken is seared nicely, place the skillet in the preheated oven and roast for 20-25 minutes until the chicken is cooked through. The chicken is ready when an instant read thermometer reads 160-165 degrees F. When chicken is up to temp, let rest for 10 minutes. Enjoy! This recipe for Easy Thai Chicken originally published on Life Tastes Good on June 25, 2013. I have updated the photos and tweaked the recipe slightly. If I'm reading this right, you cook thighs directly from the freezer. If that's right (and I hope it is), how do you adjust the cooking time in the pan and in the oven? No. Sorry for the confusion. I do thaw the thighs first before cooking.